This is the cover of last week’s edition of the New Yorker magazine, which arrived in the post this morning. Is the backlash under way–is this the “Ancient Régime” fighting back?! The cover looks like a swipe at what people call the “food police.” And on the college campus where I work, sometimes the food police are out in force! I found my roundabout way to your food blog – and I have pre-ordered your book at Amazon – because I have a sabbatical year in which I am hoping to reconnect with what I enjoy about cooking and eating well. There is a history of type-2 diabetes in my family (my beautiful Italian grandmother passed away at 70 from complications), so I want to take a preventive approach. Reading here and trying your recipes are part of that. Conversations about food become political, even ideological pretty quickly. 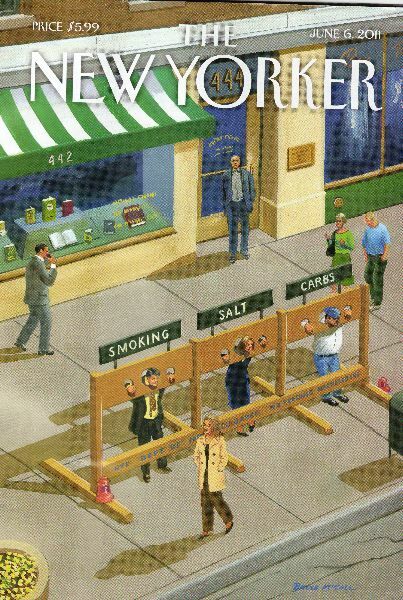 And also moralistic as the New Yorker cover suggests. I can’t imagine adopting a vegan diet, but I am not insensitive to animal suffering, so there’s a dilemma. The sustainability issues of our food system are also disturbing. We had Raj Patel (who wrote a book called “Stuffed and Starved”) talking about these issues in a lecture on campus this past spring. He was very persuasive (and lit up a cigarette as I was escorting him to the talk – I hesitate to write that because he could end up in the stocks). So sometimes there is a backlash, I think. People want to be able to enjoy this basic pleasure without carrying the weight of individual and collective guilt on their shoulders. It’s almost as if food becomes the enemy, which can’t be right. But – of course – smoking and salt and all the rest are still bad for us. In the US at least, people often talk in terms of “rights”: I have a right to smoke, to eat the way I want to eat, and so forth. On smoking, we have made a lot of progress, but on eating well we have a long way to go. And I think it is partly our culture, especially when I compare it to France. Sorry I went on for a bit. It is off the top of my head, so I hope it makes sense. I don’t like to think of myself as even a cadet in the food police though! Have just discovered this page! I was an avid fan of Poldark and as a 7 year old remember seeing you and the cast at a charity cricket match in Cornwall. Many years later I had the priviledge of meeting Winston Graham as a mutual friend had invited him along for dinner at my parents- which I cooked! It was cod rolled with a cheese and parsley stuffing -if my memory serves me right with cranachan for pudding! Wonderful memories of an evening filled with humour-a true kindly gentleman. I am also really pleased to discover your recipes as my father has diabetes and with my wife expecting our first child in August we are trying out new recipes as she has been turned off food at regular intervals throughout her pregnancy. As regards the frontcover re.Food Police-both my wife and I are teachers in Scotland-I moved from my native Cornwall 15 years ago-and here although fantastic quality meat is available and to a lesser extent fish,it is very difficult to get decent fruit and vegetables because fresh fruit and veg.is just not eaten regularly by many of the population.This is despite initiatives to give free fruit to school children and to try and introduce it more into school meals.What we find amazing is how the shelf life of veg.from super markets is so short once brought back home.As for smoking it is wonderful smoking is banned in Public buildings but trying to walk in the streets at any time of the day is unpleasant due to all the smokers standing outside buildings lighting-up! Anyway I have moaned enough! I shall go off to the Farmers Market to get some decent lamb for a casserole tonight and dream of four weeks time when I shall be sitting on the beach at Chapel Porth St Agnes eating my Cornish pasty ! Thanks for that Christian–sad what you say about the veg&fruit situation up there. So glad there’s a Farmers Market you can go to–a morale booster. Congratulations to you and your wife–not long now! Happy you met Winston–who was a wonderful writer and without whom none of this would have happened. Thanks Robin for your good wishes.I always thought some Poldark scenes were shot in the StAgnes area.Incidentally on July17th I’m hoping to link up with a sinfonia I used to play with who are performing in St Winnow Church which if memory serves me is where a Poldark wedding was filmed!! I’m so pleased I’ve found this site and will look forward to purchasing your book when it is pub. in August, I could put it next to the Making Poldark book you signed for me in 1978! !